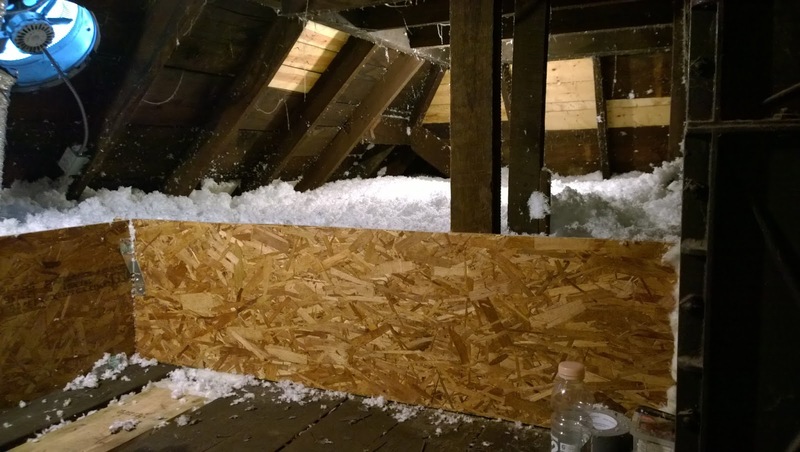 But since I'm still stressed out over the plastering, lets talk about what the plastering made possible, namely, attic insulation. 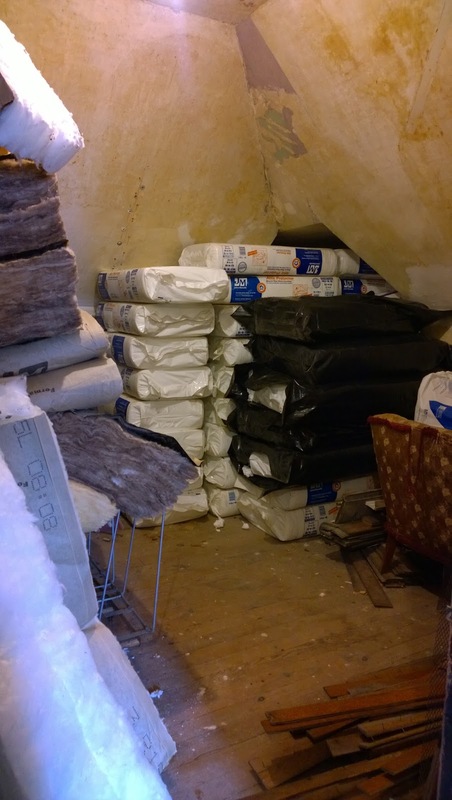 Believe it or not, we bought all our blown in insulation nearly five years ago when we first bought our house to get the 25% discount running at Lowe's and to beat that years tax rebate (an additional 30 percent I think?). 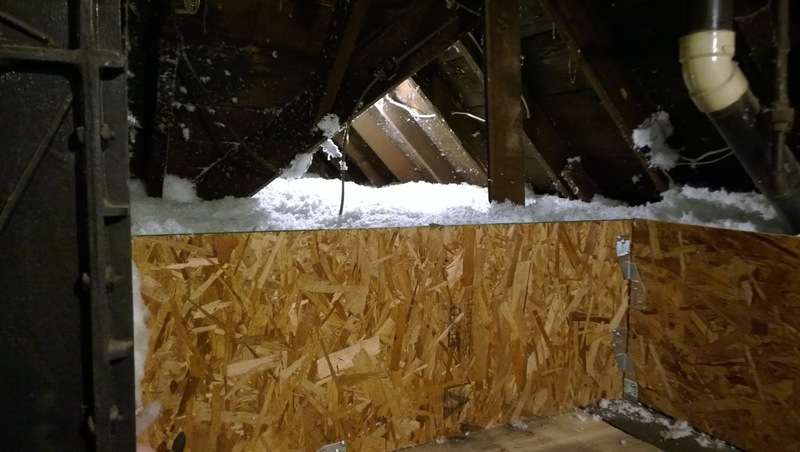 Installing it was not only dependent on ceilings, but also on new electrical, new roof, siding and gutter repair, as well as proper plumbing venting. 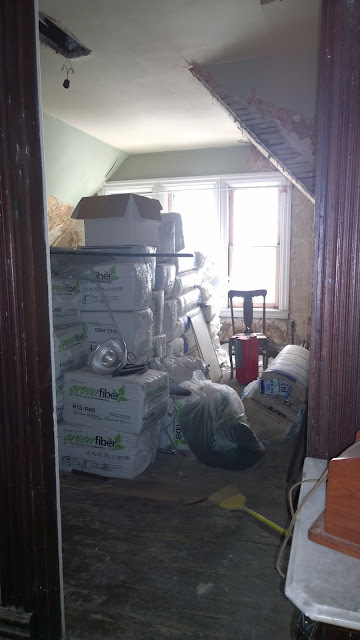 All those things have been done for years now, with over a hundred bags of cellulose and fiberglass taking up two full rooms of our third floor. The space they took up made working on those rooms impossible, and to add insult to injury about 20 bags that were in front of windows exploded from the sun degrading the plastic bags, and a certain cat decided that all that fluff made an excellent litterbox before we discovered the issue. Knowing that the plastering would eventually get done I began working on the attic a month ago. Work that had already been completed included removing all the squirrel, raccoon and bird nests, insulating and sealing the third floor knee walls, and running/fixing some wiring. The plan had been to do all this while it was still cold out, with the plastering delays the attic became my personal hell on earth. 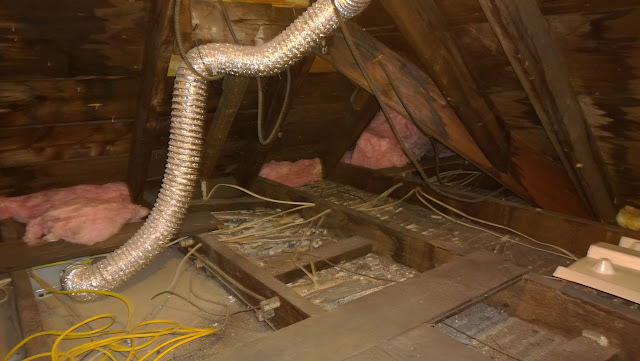 Well over a century of household and Pittsburgh soot, soaring temps, cobwebs, rusty nails and tiny confined spaces made this one of the worst projects yet (second only to deconstructing the schoolhouse). 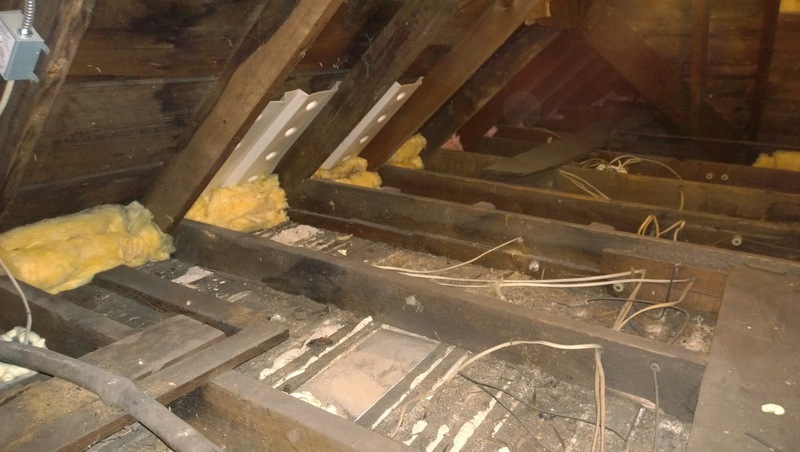 Still to do are cutting some additional batts to sit on the platform, and restoring and insulating the original beadboard attic hatch. Now, if only I could fast forward to fall and winter to see how effective all this is. you should have a good idea if your house is easier to cool down this summer too. I know you're putting equal amounts of research and thought into how to do your insulation, hopefully getting it in doesn't take you 5 years like it did me. Whew! Aren't you glad that miserable job is over?? Hopefully it pays off in big savings this winter. You have no idea, all those batts sitting around have been mocking me all these years! I sometimes like to discover new posts on blogs.